Exclusive: The Mondo Poster for Thor! Alamo Drafthouse Cinema, which has been called the "coolest movie theater in the world" (Wired), and Mondo, their collectible art boutique, create limited edition screen prints of new and classic films. 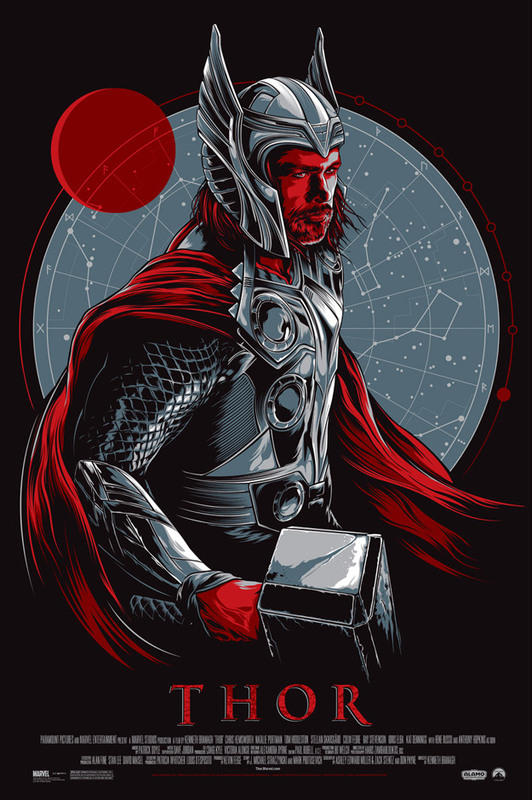 Their next release, THOR, will go on sale Thursday, May 5 at a random time at MondoTees.com and we've got an exclusive first look at the poster. Follow @MondoNews for the "on sale" now announce. The THOR art was created by Ken Taylor and you can click on it below for a bigger version. You can also find previously-released Mondo Tees by clicking here, including INGLOURIOUS BASTERDS (Art by Tyler Stout), IRON MAN 2 (Art by Tyler Stout), SCOTT PILGRIM VS. THE WORLD (Art by Martin Ansin), TRON LEGACY (Art by Eric Tan), LET ME IN (Art by Olly Moss), PAUL (Art by Tom Whalen), RUBBER (Art by Olly Moss), SOURCE CODE (Art by Olly Moss), SUCKER PUNCH (Art by Ken Taylor) and TRUE GRIT (Art by Aaron Horkey).